I received a text message a few minutes ago from the Brady Campaign. It asked me to call the Manchester, NH office of Sen. Kelly Ayotte (R-NH). Gun prohibitionists (or anti-gun exhibitionists) have taken it upon themselves to hold a sit-in at Ayotte's office "to demand action". Ayotte is far from perfect when it comes to gun rights. While she did vote against universal background checks (Manchin-Toomey I and II), she is part of a bi-partisan group pushing a bill before the Senate that would add those in the Terrorist Screening Data to the NICS denied list "with due process". This said, Ayotte is certainly better for gun rights than her opponent Gov. Maggie Hassan (D-NH). Hassan vetoed constitutional carry, voted against the Castle Doctrine as a state senator, has dodged questions on whether she supports a new AWB, and is being supported by anti-gun demagogue Sen. Chris Murphy (D-CT) and his PAC. I might suggest people do call Ayotte's Manchester office and say you don't support the Brady Campaign or any gun control measures. Her Manchester office number is 603-622-7979. By the way, the number I texted back to the Brady Campaign earlier this month is not a real phone number and actually conveys a vulgar message. I'll let you figure it out. I went to the semiannual Greensboro Gun Show this weekend with my friend Jeff (Olivia Grace's paternal grandfather). 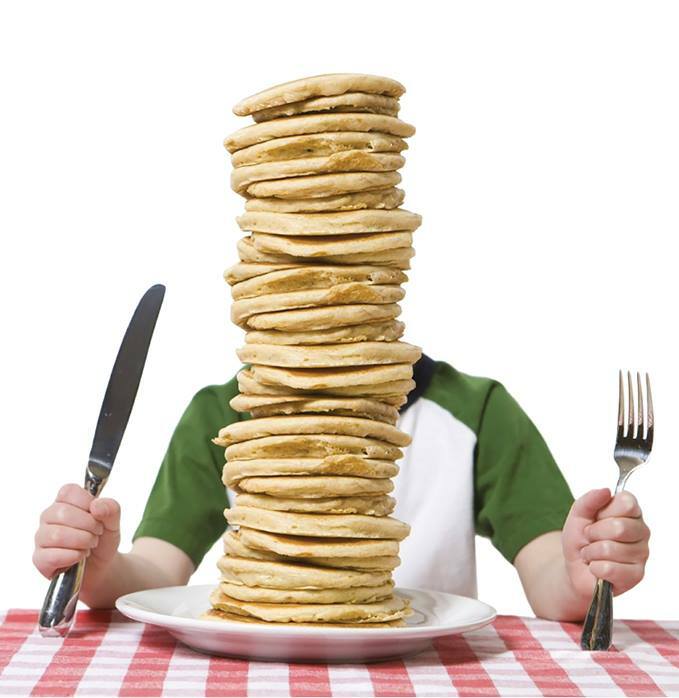 Before the gun show itself, we met for breakfast with Doc Wesson at a local pancake house. Doc aka The Podfather has been podcasting at The Gun Nation since 2007. We had a great time talking about guns, podcasting, blogging, industry, flying, etc. I think we all had a great time and it was a great way to start a trip to the gun show. Doc, for business reasons, guards his identity. Given that pictures of Doc don't exist some people might assume he is a phantom. I can assure you that is not the case. I snapped this quick picture of Doc while he wasn't looking. It didn't come out quite how I expected! As for the gun show itself, it had a moderate crowd. There were a goodly number of people but the aisles weren't so crowded that you couldn't walk down them. In general, there weren't as many surplus dealers as I expected, there were a number of private sellers with tables selling their hunting rifles and shotguns, and more knife dealers than I expected. Nate and Nate from N82 Tactical were there. I ended up with one of their IWB holsters for my Ruger LC9s Pro. Time will tell but it looks like a very comfortable holster. I also came home with a 1200 ft. roll of 550 O.D. green paracord and a box of cast lead 105 grain .38 caliber bullets. I hope to get those loaded up to use for plinking. I did look at an Ithaca 51 with 2 extra barrels but passed on that. The other thing on my want list was an Anderson Manufacturing AR15 upper. I found a few but prices ranged from $80 to $120. Given they are selling in the $50 range on the Internet I passed on this. We finished the day by having a family dinner at Clark's BBQ in Kernersville. As their T-shirts say, they are centrally located between Dollywood and Myrtle Beach. I came across an interesting rifle on an auction site. It was a custom Mauser in a most interesting caliber: .257 B.B. Magnum. I had been looking for a .257 Roberts which this obviously is not. That said, it has aroused my curiosity as I love oddball, wildcat calibers. As to what the B.B. stands for I've been given several suggestions. "Barrel Burner", " Big Bore", and what is probably the correct answer, "Belted Bottleneck". You can see a picture of the rifle below. It has some rather nice wood plus some interesting inlays in the stock. Has anyone ever heard of this caliber? Would I be stupid to even bid on a rifle where I can't even find published load data? Do you think this would be a screamer? OK, I think I know the answer to that last question. I really am interested in what readers have to say about this. UPDATE: The rifle sold onsite to someone for $250 plus the auction house premium of 18%. In the same auction, another custom Mauser in .338-06 sold for $200. Interestingly, that caliber is much more mainstream yet the rifle sold for less. Inspector Harry Callahan would approve. It seems that the Auto Mag Pistol in .44 AMP, the pistol used by Clint Eastwood as Dirty Harry in 1983's Sudden Impact, is set to make a comeback. According to a press release that came out yesterday, an investor has purchased the rights, plans, and spare parts for the Auto Mag Pistol from the original developer's family. The Auto Mag was last made in 1982. The new Auto Mag is still in the prototype stage with no set release date of which I'm aware. According to their website, they have produced about a dozen prototype guns for testing. Below is a computer rendering of their prototypes. Computer rendering from Auto Mag LTD Corp.
You can keep up with their progress here. If you are one of those folks who actually has an Auto Mag Pistol Model 180, they also are selling spare parts and you can find those here. 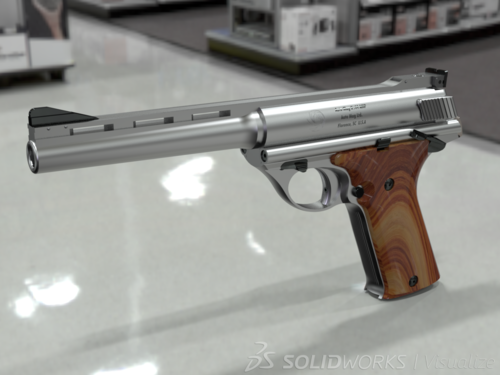 In an era where most new handguns are polymer based, it is nice to see someone coming out with something made of steel and wood. I got the most wonderful news yesterday. Paul Lathrop, host and producer of The Polite Society Podcast, called to tell me that the Sarpy County (Nebraska) prosecutors were dropping all charges against him. Paul and his wife Susan have their lives back again! Paul had been charged with making "terroristic threats" and with possession of a firearm during the commission of a felony. These charges stemmed from an accusation by another driver at a truck stop in Sarpy County. That truck driver took exception to how close Paul's student came to his truck at the diesel pumps. He then tried to enter the cab to assault Paul and the student and was told to back off by both the student and Paul. Later, this hothead called the sheriff's department and accused Paul of threatening to shoot him which led to Paul being stopped on the highway and arrested. Paul will now be free to tell about his whole ordeal. The next episode of the Polite Society Podcast will feature it. I'm just glad to get my friend back from under that dark cloud that had been hanging over him. Finally deciding to upgrade your computer to a new one is a leap of faith. You are hoping that the new computer with its shiny new processor and extra-humongous hard drive will bring a quantum leap in computing ability. The new computer will allow you to be faster, stronger, and jump higher or so you hope. What you forget is all the tedium involved in actually making that switch. Going through your old computer, finding what you absolutely must save, what you think you might need in the future, and the files that you decide to save just because takes time. Then you have to burn these files to CDs or DVDs or copy them to your spare hard drive which you plan to move to the new computer. All of this takes time which you could have used for important stuff like blogging or posting the latest political meme on Facebook. I know there are programs that are supposed to make the switch easier but I didn't have them and wasn't sure I wanted to spend the money to get them. Then there is making sure that you have a way to save all the old emails, bookmarks on your browser, etc. I was fortunate to find some utility apps that let me do this fairly easily. I wasn't so much concerned about bookmarks as I was about capturing my old emails and address book. I'm guessing it would have been easier if I had been using Outlook instead of Mozilla's Thunderbird. That said, I started many years ago with Eudora and Thunderbird was as close to that as I could come to it. The new computer is an Acer Aspire with lots of RAM, a huge hard drive, a smaller solid state drive to handle the start-up, and a fancy graphics card running Windows 10 Home. When I compare that to my early PCs, I'm blown away. My first computer was a Kaypro 4+88 which ran CP/M 80 and had a co-processor to run MS-DOS v.1.25. It was followed up by an AT&T PC-6300 which actually ran DOS v2.10 using two floppy drives. I upgraded that PC later with a Quantum Hardcard 20 MB hard drive which cost as much as my entire new computer. Many other computers followed it over the years as new software demanded more and more power. I'm still in the process of making the conversion. Yesterday I went to install my 1 TB secondary drive which had tons of files from the earlier computer. Of course, I ran into problems. The new computer only had two SATA connections on the motherboard and they were already taken. Not being a techie it took some research to find that SATA data cables are dedicated and that you can't use a splitter like you can with power cables or like you could do with the older IDE drives. I was going back and forth between the new computer and Google images to figure out if I even had an open slot. In geek-speak, it was a PCI Express +1 slot. Thanks to Amazon Prime, my new card that will allow me to add the extra drive will arrive tomorrow. I don't know how much the new computer will impact my blogging but I hope it will allow me to post better photographs. 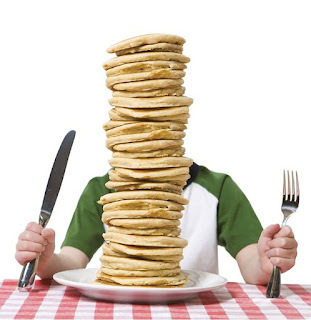 I have a new copy of Photoshop Elements which I couldn't use on my existing computer because it needed Windows 7 or better. The old computer was from the Windows Vista era if that gives you some idea on its age. I think back to the computing power that it took to put a man on the moon or for Lockheed's Skunk Works to design the SR-71 and this new computer puts it to shame. That said, those were tremendous accomplishments and no amount of computing power can take the place of the innovative mindset that those engineers and project managers possessed. We know our opponents hate us and our culture. Some of them go so far as to want us dead. We also know what happened to a disarmed people when those in power want them gone. Just ask the Jews and the Armenians. I came across this patch on Instagram this morning and thought it was extremely powerful in its message. It comes from patch maker Violent Little Machine Shop. If you want one, you can find it here. 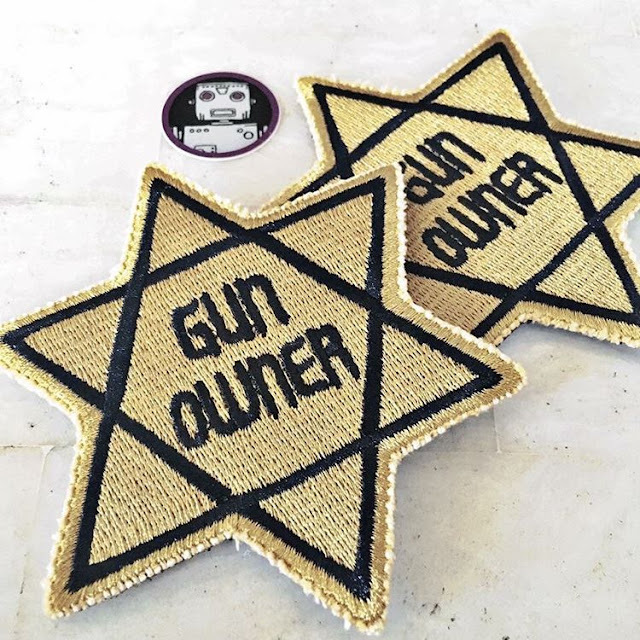 violentlittleGo to your local office and "register" yourself and your family for your beliefs... No big deal they said... "Turn over your arms, the government will take care of you" they said... Get your flair at violentlittle.com. Thanks for the photo @never_out_tactical. First there were the many mayors who were members of Bloomberg's Mayors Against Illegal Guns who ended up convicted of criminal activity. Now, in a step up, we have a state attorney general who owed her election, in good part, to ads on her behalf by former Mayor Michael Bloomberg being convicted of perjury, obstruction of justice, and other crimes. Michelle Henry, who joined (Montgomery County District Attorney Kevin R.) Steele in presenting the prosecution case, painted Kane as heedless of the law as she carried out her crimes. "She knew it was wrong, she knew it was against the law, and she didn't care," Henry told the jury. "She did it for revenge. And after that happened, she covered it up with lies." In its verdict, the jury found Kane guilty of perjury in two instances: That she lied about her involvement in the leak and cover-up, and that she lied again in telling a grand jury she had not signed a secrecy oath pledging not to reveal confidential grand jury information. Prosecutors later found such an oath signed by Kane. Kane sought revenge against former state prosecutor Frank Fina who she thought he was the source of a news story that was highly critical of how she shut down the prosecution of corrupt Democrats in Philadelphia. In addition to the two felony counts of perjury, Kane was found guilty of the misdemeanor crimes of conspiracy, official oppression, and false swearing. Judge Wendy Demchick-Alloy ordered Kane to surrender her passport and warned that she would be jailed immediately if there was any retaliation against witnesses. Kane could receive up to 28 years in prison but is expected to receive much less since she had no prior criminal record. Prior to being elected Pennsylvania Attorney General, Kane was an assistant district attorney in the Scranton area who gained attention for criticizing how the investigation of former Penn State coach Jerry Sandusky had been conducted. Kane, who has already lost her law license, has until the day of her sentencing to resign. She so far has resisted calls by Gov. Tom Kane and other leading Democrats to step down. With Kane's conviction, I guess a renaming is in order. Henceforth, the organization formally known as Everytown for Gun Safety will be known as Everytown Moms Demanding Illegal Mayors and Attorneys General. UPDATE: Kane has announced her resignation effective at the end of the day on Wednesday, August 17th. She says she has "been honored to serve the people of Pennsylvania, and I wish them health and safety in all their days." She faces sentencing in 90 days. While she has promised to appeal, it will be very interesting to see what sentence she gets. The cartoonist for the Philadelphia Daily News and Philadelphia nails it in the tweet below. Kane, the first female AG in Pennsylvania history, broke the glass ceiling...and floor. Mike Vanderboegh passed away in the wee hours of the morning today. Cancer finally did to him what the government, the gun prohibitionists, and the Southern Poverty Law Center could not do. It stopped him. Mike was 64. I had occasion to meet Mike at a number of Gun Rights Policy Conferences and NRA Annual Meetings. Despite the impression he might have given by his angry prose, in our first meeting at the 2011 NRA Annual Meeting in Pittsburgh I found him to be a loving father who was more interested in talking about the soccer prowess of his two daughters than he was about gun related stuff. Mike should always be remembered for the role he (and David Codrea) played in exposing Operation Fast and Furious. It would have remained a virtually secret government operation aimed at increasing support for gun control without his efforts to get congressional investigators interested. He is owed an eternal debt of gratitude by the gun culture for this. 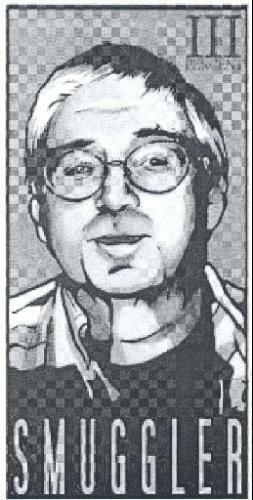 There is a long obituary and account of his life at the Kansas City Star. It called him a militia and "Patriot" leader in the headline. Even the despicable SPLC had a long account his life and death. The comments on the announcement there are as one might expect from those of their ilk. Nonetheless, it looks like Mike had the last word even there. Yet the Declaration of Independence and the Bill of Rights can never die “as long as there remain free men and women who believe in the Founders' vision,” Vanderboegh wrote. Sipsey Street Irregulars will not be going away. Mike's son Matthew has taken over running the website and has continued postings there. I do hope he will finish his father's manuscript of Absolved as it was a great story in the John Ross/Matt Bracken mold of anti-gun control fiction. The announcement of Mike's passing on Sipsey Street can be found here. The monthly contests from Aaron at Weapon-Blog have been posted. You can see all the firearms below. He has some interesting guns in this month's list such as the Lionheart LH9. This is an updated version of the Daewoo DH51 which has the Safety Fast Shooting System. The US State Department's Directorate of Defense Trade Controls recently issued so-called guidance on what activities would come under the umbrella of the International Trade in Arms Regulations (ITAR). We just interviewed gunsmith Joseph LaJoy of LaJoy Precision on Friday night for the Polite Society Podcast on this very issue. Activities listed as manufacturing and thus subject to ITAR include traditional gunsmithing activities such as threading a barrel or reaming a new chamber. Gunsmiths will now have to pay an annual fee of $2,250 if they do something as simple as that or face massive fines and/or imprisonment. We concluded the rationale behind this "guidance" was to attack the gun culture and to drive gunsmiths out of business. Joseph LaJoy said in the interview that he wished groups like the National Shooting Sports Foundation would get involved in the issue. From Joseph's mouth to the NSSF's ear, the release below was sent out on Saturday. Why has the Obama administration refused to move ECR forward for our industry? It is really very simple. The Obama Administration is singling out our industry for different treatment under the ECR because of its gun control politics. It is time to force Congress to step in and stop the Obama Administration’s gun control agenda from stopping this needed reform. See the ECR dashboard. How can members of the firearms industry and gun owners help? Call your U.S. Representative at 202-225-3121 and U.S. Senators at 202-224-3121 urge him or her to support Rep. Collin Peterson’s (D-Minn.) Resolution, (H. Res. 829) that demands the Obama administration complete the ECR and publish the proposed rules to transfer the licensing of commercial and sporting firearms and ammunition products to the Department of Commerce (which does not require registration or payment of a fee). Tell your U.S. Representative and Senators to force DDTC to stop imposing excessive and onerous registration fees on small businesses that do not export products. Tell them to support language in the Fiscal Year 2017 State and Foreign Operations Appropriations bill that will reduce the registration fee to a nominal amount for all non-exporting manufacturers and component part manufacturers. Tell your U.S. Representative and Senators stop the Department of State from exceeding its statutory authority; that mounting new sights to improve accuracy on your hunting rifle doesn’t require you to register with the Department of State and pay a fee of $2,250. It is within the power of the President of the United States to both commute sentences and grant pardons. President Obama used that power on Wednesday to commute the sentences of 214 individuals. This was the greatest number of commutations at a single time. These commutations are being portrayed as being for mainly "nonviolent drug offenses". President Obama went on Facebook to argue that our drug laws are too harsh and that Congress needs to institute sentencing reform. But this is a country that believes in second chances. So we've got to make sure that our criminal justice system works for everyone. We've got to make sure that it keeps our streets safe while also making sure that an entire class of people like Sherman (Chester) isn't relegated to a life on the margins. The impression given is that many of those who had their sentences commuted were convicted of having relatively small amounts of drugs. How the Obama Administration defines "small" is open to debate. Would you consider five kilograms of cocaine a small amount given the approximate street value per kilo is around $30,000? At least 15 of those convicted had this much or more in their possession when arrested. Of course it would be hard to top Ralph Casas of North Miami Beach who was convicted of conspiracy to possess with intent to distribute over 9,445 kilograms of cocaine. What does get me is that not all of these are "non-violent felons". Jazz Shaw at Hotair.com points out that about a fourth of those who had their sentences commuted were also convicted of crimes involving firearms. Going through the list - and I may have missed some - I found 25 convicted felons in possession of a firearm. For some reason I don't think these guys went through a NICS check. I know for sure that Kenneth Lee Kelley of Westville, OK didn't go through a NICS check because he was convicted of not only two counts of being a felon in possession but also for having a stolen firearm. Nor did Ervin Darnell Worthy of Akron, OH who had a firearm with a altered serial number. Joshua Boyer of Tampa, FL takes the prize for most interesting firearms offense. He was convicted of having possession of a firearm that was not registered in the National Firearms Registration and Transfer Record. If I were to speculate, Mr. Boyer was emulating Jack Miller of US v. Miller fame in that he had a sawed off shotgun. He may, of course, had a full-auto firearm or a silencer. Frankly, I really am not that sympathetic to junkies who ruin their lives by their choices. I am at the point where legalizing all drugs is starting to make some sense given the militarization of the police, overuse of SWAT teams, etc. However, knowing that junkies will do anything for their next fix including killing you or me for the change in our pockets, I am not that sure that commuting the sentences of those who facilitate drug use is the correct thing to do if we want to "keep our streets safe." I don't necessarily know the correct thing to do but commuting the sentences of many of these felons doesn't quite sit right with me. The National Shooting Sports Foundation released their adjusted NICS checks numbers for July 2016. Let's just say upfront that all the gun control talk coming from Democrats is having an impact. It's just not the one they want. 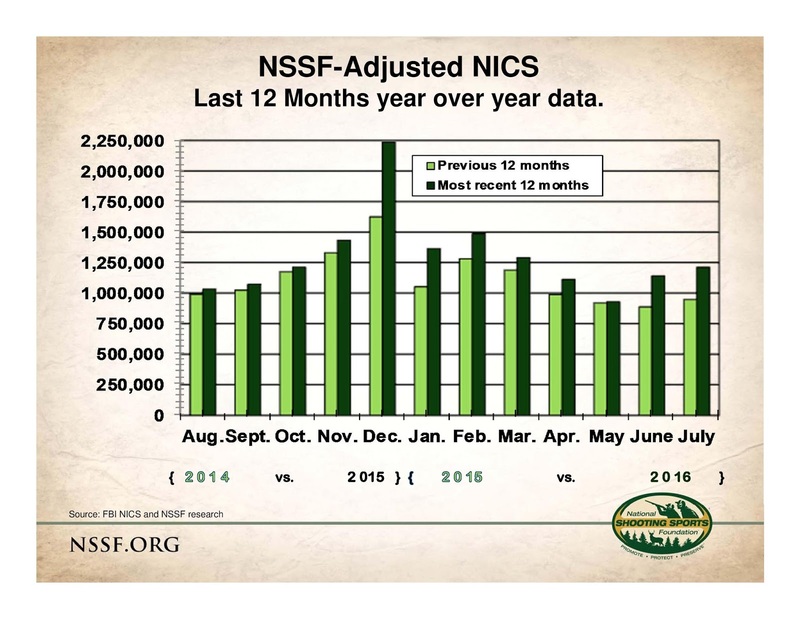 The July 2016 NSSF-adjusted National Instant Criminal Background Check System (NICS) figure of 1,210,731 is an increase of 27.9 percent compared to the July 2015 NSSF-adjusted NICS figure of 946,528. 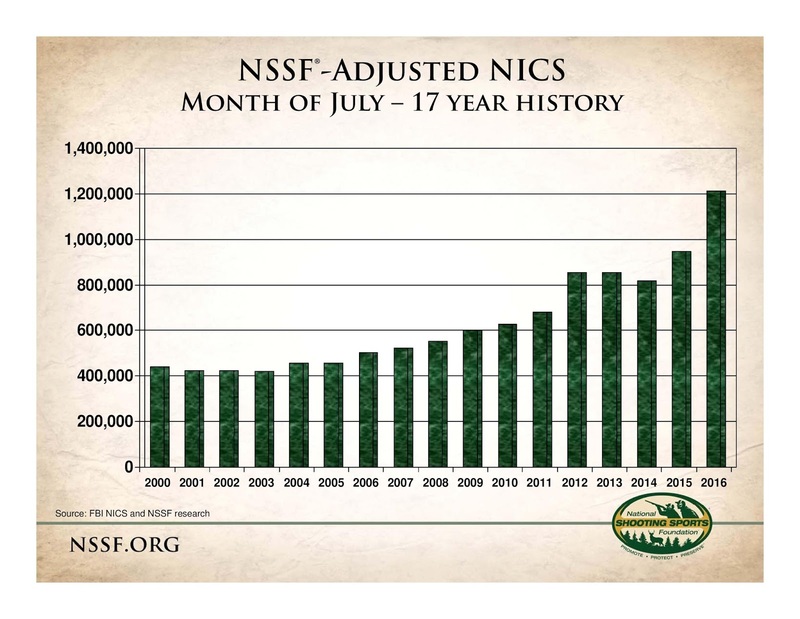 For comparison, the unadjusted July 2016 FBI NICS figure of 2,187,190 reflects a 37.6 percent increase from the unadjusted FBI NICS figure of 1,589,462 in July 2015. As you can see in the graphic below, July 2015 had been the highest on record as well and it just overwhelmingly eclipsed. The next graphic shows the year over year results by month. For the last twelve months, the adjusted NICS checks numbers were greater than the same month in the prior year. As always, NICS checks are not a perfect correlation with gun sales as many states use the NICS System for carry permit purposes and as a CCW is accepted in lieu of a NICS check in many states such as North Carolina and Texas. Sorry for the light blogging this past week. We just got back this weekend from St. Louis where we were visiting family and friends. I did get to visit with fellow gun blogger Charlie Foxtrot and his wife. He helps us on The Polite Society Podcast and he blogs at Not One More Gun Law. After a lifetime of living in Southern California, he is still somewhat amazed at the change in the role of the gun culture in local politics. He noted that politicians in California would never mention their NRA-PVF grades especially if they were better than a "F". By contrast, in Missouri, candidates fight over who is more gun friendly and brag on it. I also got to visit a really great reloading shop in St. Charles. Graf's Reloading - not be confused with Graf & Sons - is a full-service shop dedicated to reloading. While they have a small gun counter, reloading is their specialty. Seeing row after row of just bullets in any weight, style, or caliber was amazing. If you are in the St. Louis area and have time, they are just off of Interstate 70 in St. Charles. I found their prices to be very competitive and cheaper than the Bass Pro Shop down the street. My granddaughter Olivia Grace traveled with us to St. Louis and was a big hit. She is fast approaching one and a half. As the picture below shows, she might have a future in reloading as she was quite interested in the bags of bullets. We also trolled a number of thrift shops while in the St. Louis area. I picked up that cast iron pot in the picture at thrift shop and think it will be just right to serve as a lead melting pot. For $4 it can't be beat.